The greatest risk of childhood death occurs during the first month of life. Cambodian hospital in Siem Reap has successfully reduced newborn mortality in their facility and in the region. M4ID visited the hospital to learn from their good practices. Newborn mortality keeps decreasing globally, but advancements have been slower than in child and maternal health. There are marked disparities in neonatal mortality across regions and countries. Over 90 percent of newborn deaths occur in Africa and Asia; a child in Sub-Saharan Africa or Southeast Asia is nine times more likely to die in the first month than a child in a high-income country. Most newborn deaths are caused by treatable conditions, including prematurity, birth asphyxia and infections. There is a great need for new approaches and deeper understanding to newborn health. M4ID has launched a newborn health exploration and design project that focuses on finding new approaches and alternative methods to newborn care in low-resource settings. The insights that have been gained from field research in India, Cambodia and Nigeria will be used to innovate widely applicable and scalable solutions in low-resource settings. Often newborn care is thought to be complex and requiring high-technology devices, which acts as a barrier to care. In reality most newborns could be saved by simple, low-cost techniques such as hygienic care practices, fast resuscitation, immediate drying and wrapping, delaying first bath and immediate initiation of breastfeeding. The Angkor Hospital for Children in Siem Reap, Cambodia has successfully reduced newborn mortality in their facility and in the region. As part of the Newborn Exploration project, M4ID visited Cambodia in January to learn from the good practices and how they could be applied in other facilities. It is obvious there is not one quick-fix to reduce newborn mortality. However, the M4ID team, Design Lead Rose Matthews and Development Specialist Jenni Hämäläinen gathered some insights on how the hospital tackles newborn mortality. At the Angkor Hospital the staff decide which key performance indicators are being tracked in their unit. The statistics of improving the hand hygiene, infection control and mortality and morbidity rates are brought to the attention of the staff. Seeing the improved results keeps the personnel motivated to work as a team to achieve the goals and to improve the outcomes further. Staff must be involved in the changes and feel the ownership over new solutions. A dedicated area for neonatal care and a specialised neonatal team are crucial for reducing newborn mortality rates. Setting aside a dedicated area only for newborns not only helps with infection control, but also helps set the right mindset for the staff: caring for a newborn baby requires a completely different approach compared to caring for older children or even for older babies or toddlers. Entering a dedicated neonatal space helps staff prepare for this approach, and change their mindset accordingly. A good foundation for teamwork is crucial in achieving mortality reduction goals. Setting up a specific neonatal team has taken pressure off from other staff members to be involved in neonatal care, which is often thought difficult. A dedicated and united neonatal team brings the team members closer, helps them work together to achieve mortality reduction, and makes them proud of their work. Curing only the illness of the newborn isn’t enough. The key to long-term health is looking at the bigger picture: one needs to take into consideration the broader situation of the child and their family, whether they have enough food to eat and a safe place to sleep. The Angkor Hospital also teaches parents about risk signs, nutritious food and hygiene practices, which contributes to long-term health for the whole family. The Angkor Hospital for Children is a non-profit hospital funded largely by donations and has better resources than many other hospitals. However, the mindsets, attitudes and staff motivation techniques are something that can be applied and adapted also to other settings even with more limited resources. 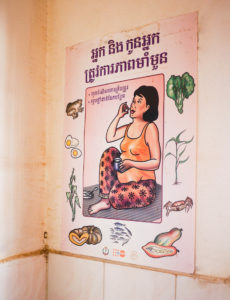 A poster advising about maternal care at the Ta Yek Health Center in Cambodia. Darmstadt, G. L., Bhutta, Z. et al. (2005). Evidence-based, cost-effective interventions: how many newborn babies can we save? The Lancet 365(9463), 977-988. Darmstadt, G. L., Kinney, M. et al. (2014). Who has been caring for the baby? The Lancet, 384(9938), 174–188. WHO. (2015). Every Newborn Progress Report 2015.